The AlpineHaus is situated in the quiet, gated Blue Spruce Village Victorian community that has the Big Thompson River running through it and is ¼ mile outside the Estes Park city limits. 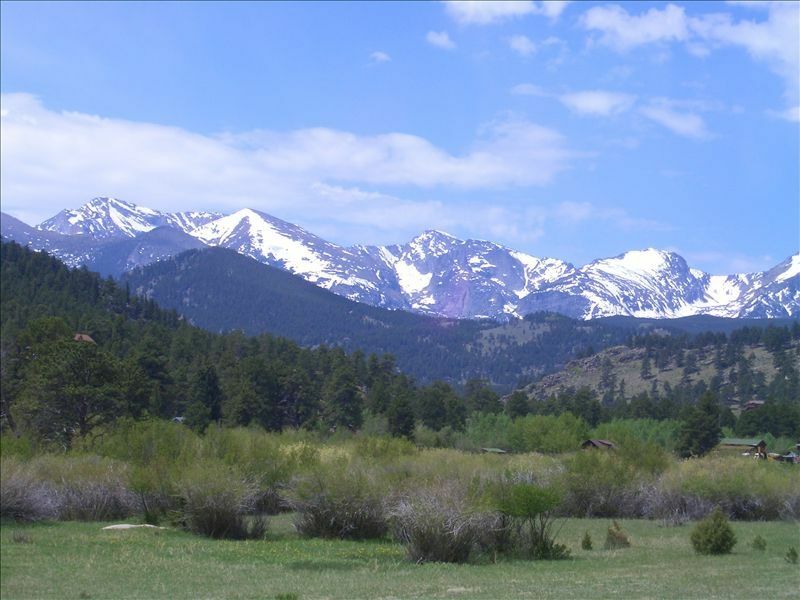 The Rocky Mountain National Park Beaver Meadows Visitor Center and Park Headquarters are two miles from our vacation home and it is just a five minute drive to downtown Estes. The AlpineHaus is only ¼ mile from the original early 1900's entrance to the Park and a trailhead that leads to the Bear Lake/Moraine Park area, on the edge of the YMCA of the Rockies Conference and Activity Center. Built in 2002, our three-level townhome has 2200 square feet of living space. The main level offers a greatroom with a stone fireplace (gas burning) and opens to a large deck with a picnic table and gas grill. Oak wainscoting and large windows adorn the greatroom and separate dining area with a large dining table. The fully-equipped kitchen and dining area have wood floors adding to the warmth and charm of this beautiful home. The main level greatroom also has a large LCD TV with a DVD player. Sit on the large deck to relax and view the elk, an occasional bear and other wildlife! The upper level has three large bedrooms and a loft area with a game/puzzle table. The master bedroom has a king-size pine log bed and furnishings with a large bay window and jetted whirlpool tub in its private bathroom. The second bedroom also has a pine log queen bed and furnishings, two dormered windows and a private entrance to the second full bath (which also opens to the loft/hall area to share with the third bedroom). The third bedroom has a queen sized bed and a twin sized bed and dormered windows - perfect for a third couple or children. The walkout lower level has a recreation room great for kids young and old with a LCD TV, DVD/VCR, video games, and patio area. Walk fifty yards to the Big Thompson River for fly-fishing and relaxation. While our home is not directly on the river, the river runs through our private community and all owners and guests have access to common areas with picnic tables and seating areas. Free Internet access via our broadband wireless connection (bring your laptop with wireless card if you need to check in at work occasionally or just want to surf the Net for various events going on in Estes and Rocky Mountain National Park while on vacation). Or perhaps you'll want to check the weather forecast prior to departing for a climb up Long's Peak! toilet, combination tub/shower, jetted tub, Part of master suite. toilet, combination tub/shower, Upstairs bathroom for bedrooms 2 and 3. Central heating for all levels. Full-size washer dryer on-site. Laundry soap available. Shared parking outside lower level. Attached one car garage with driveway parking for an additional car. Great room on main level with sectional sofa and fireplace. Sliding glass doors open up to large deck Recreation room on walk out lower level with sofa and love seat. Stainless steel appliances and granite counter tops opens up to living area and dining room. Fully equipped. Dining room opens up to kitchen. Three flat screen TV's, including a 37' LCD in Great Room, another TV in the lower level rec room and a third TV in the master bedroom. Local hiking guides, children's books and other fiction/non-fiction. ~20+ DVD's - for children and adults. Arcade sized video multi-game (see pictures). Over 100 classic arcade games! Free shuttle during peak season runs in front of Blue Spruce village to downtown, YMCA, RMNP. See VisitEstesPark.com for details.